So, this is an odd one. I've been using this program for years with my current setup (Windows 10, imgburn 2.5.8.0). Suddenly, yesterday, it started crashing every time I try to browse for a folder to use to create an image. I pick "Create Image file from Files/Folders", then click the folder icon to browse for a folder. 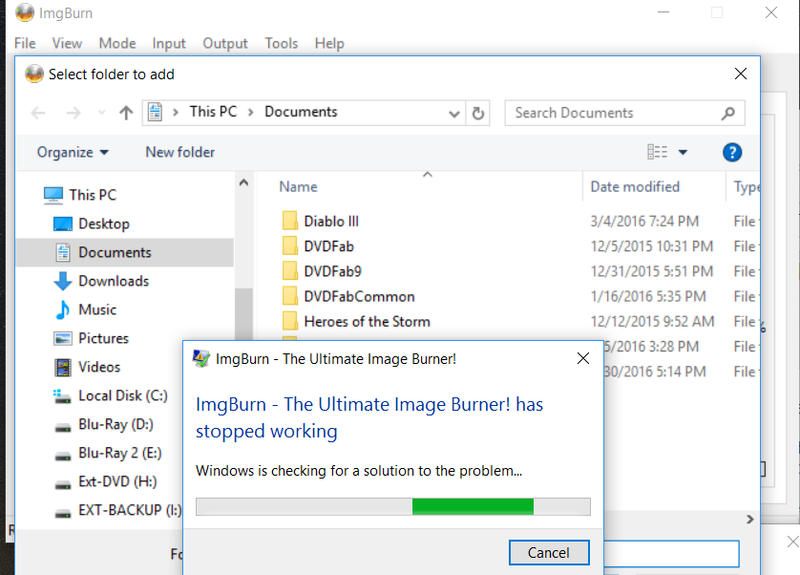 The browse dialog is briefly displayed and then it crashes and I get the Windows message "ImgBurn has stopped working". Also I've tried running as Administrator and running in compatibility mode, both cause the same behavior. It doesn't appear to even invoke the program's exception handing feature, you're just seeing the default Windows one. Is it just the folder picker box that makes it crash or does the file picker box do the same? The trouble with your issue is that once the dialog box has been 'shown', ImgBurn isn't doing anything. I 'show' the box and the program then just sits waiting for Windows to return control to it. Your issue could be related to a 3rd party shell extension of some sort... I'm afraid I've no way of knowing what's happening or why. If Windows creates some sort of crash dump whilst it's looking for a 'solution', maybe I could run that via windbg and examine it to see if it reveals the actual cause. Failing that, see if you can get a bit more info on it by going into Action Center and look at 'check for solutions' / 'view problems to report'. Find your ImgBurn crashes in the list and view the technical details. Well, turns out I have some kind of nasty virus, won't even let me boot to safe mode . Reinstall time I guess. Thanks for responding though, the fact that no one else was experiencing this helped me narrow it down.